The Regatta Lotus waterproof jacket has been worn by our young male tester during a variety of very wet, Autumn weather - on occasion in driving rain. The Lotus kept him warm and dry no matter what. He's not yet had opportunity to wear it in warm weather, so has not tested the breathability. The fit was fine - it is a good length and the stowaway, peaked hood provided a good level of protection for his face. He also liked the pockets (which were all a useful size) and the space for his name. 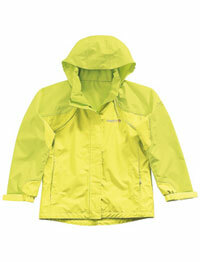 The Regatta Lotus waterproof jacket is a good, well designed garment. it may be a little pricey but will be a good investment if you do a lot of walking or other outdoor activities and need a reliably waterproof jacket.